Weekend breakfast baking is sometimes fun and spontaneous. I have been on a waffle kick for a while. 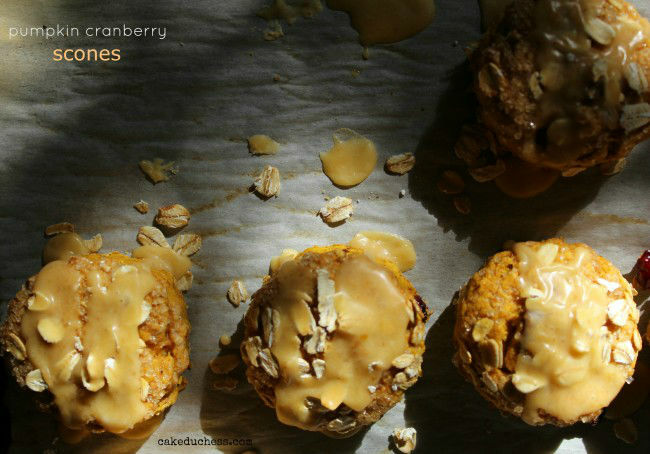 Every so often I think about scones; like these fantastic pumpkin cranberry scones. I make simple and creamy scones occasionally. 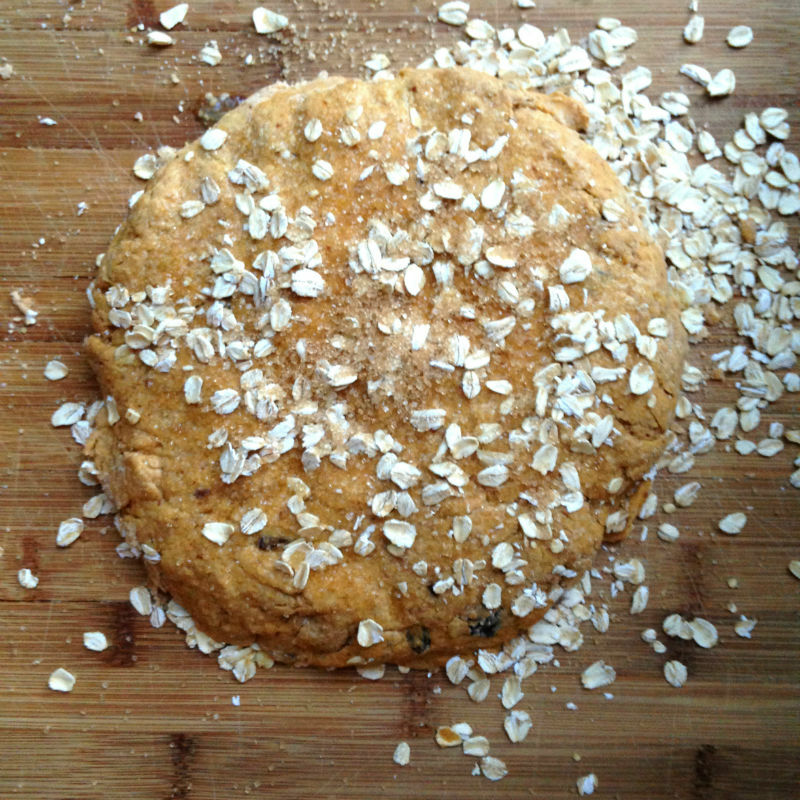 A good basic scone recipe is so wonderful to change up. You could add different chips (chocolate chips, cinnamon chips) or dried fruits. I love these kumquat poppy seed scones I made a while back and these clementine cranberry scones. 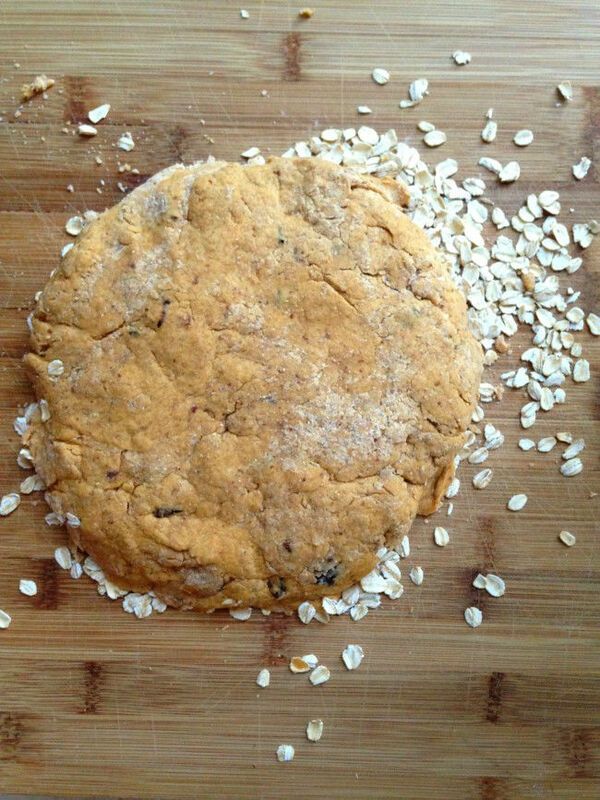 The clementine cranberry scone recipe is a great vegan recipe in case you were looking for one. I turned to Pinterest for some quick inspiration and caught these pumpkin scones one morning this weekend. With some little adjustments, breakfast was ready in less than 30 minutes. Not just any breakfast, but a very fall breakfast. Cute little pumpkin scones that I even was able to add a little ground flax seed to. I have to be straight up about the glaze; without the glaze, the scones were a more healthy type of a scone. If you are looking for a low-sugar breakfast idea, you could make it as the original recipe calls for (with only 1 Tablespoon of maple syrup)and skip the glaze. For my taste, that was fine. For my kids and hubby, they required a little extra sweetness so I increased the maple syrup by 2 Tablespoons and drizzled on an irresistible pumpkin glaze. I made the scones twice this weekend. The first time was with part whole wheat flour. I really liked the part whole wheat flour version. It’s not easy for me to sneak whole-wheat flour in every recipe and get the kids to enjoy the recipe. I will try another time and maybe just use 1/2 cup whole wheat flour and 1 1/2 cups all-purpose. It’s important to not work the dough too much. If you feel it is too sticky to work with, you could sprinkle on a little more flour into the dough while you knead it. The second time I baked the pumpkin cranberry scones, I used entirely all-purpose flour, I increased the maple syrup another tablespoon (so total 3 Tablespoons maple syrup) and I added an egg. If you decide to bake with part whole-wheat flour and follow the original recipe, the scones will be a little more dense. I added ginger and another dash of cinnamon. The smell of beautiful pumpkin scones filled with fall spice wafting through the kitchen and the house was utterly intoxicating. The next time I bake them, I am going to sub the butter for coconut oil for a delicious fall vegan breakfast idea. If you change up the recipe, let me know what you did and how it turned out! Preheat oven to 350 F. In a large bowl whisk together the lace the flours, ground flax seeds, baking powder and cinnamon. Stir in the dried cranberries. In a small bowl whisk together the pumpkin, butter, egg, vanilla and maple syrup. Add the wet ingredients into the dry ingredients and stir to combine. Bring dough together gently with a wooden spoon. Place the scones on a baking tray lined with parchment paper. Brush with orange juice. Sprinkle on the turbinado sugar and the oats. Bake for 15-18 minutes or until golden and cooked through (if you are cutting them with large biscuit cutter or cutting them into wedges, will take about 20 minutes). While scones are baking, whisk together the glaze ingredients. Drizzle on the scones as soon as you take them out of the oven. Oh I'll definitely try these out! What I actually love about scones is the delicate flavor without a lot of sugar so we can eat them warm with either jelly or cheese. I love the pumpkin-cranberry mix… just too perfect for an autumn weekend! And look how high yours rose!!! I wish I had a couple of these for breakfast right now! Delish! Love the fact that you used maple syrup as the primary sweetener (aside from the dreamy glaze topping, of course!). 😀 . Oooh! Pretty round pumpkin cranberry scones, Lora! 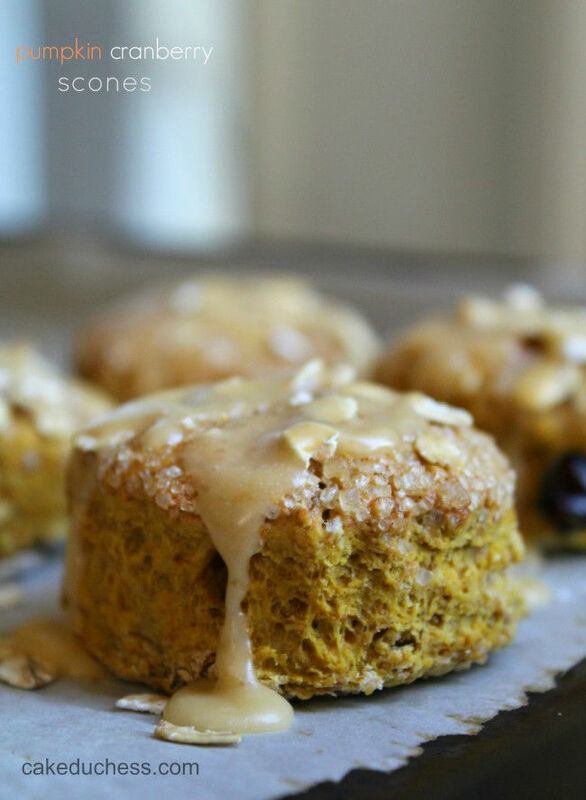 Love that you made a pumpkin glaze and made the scones lower in sugar using maple syrup. I'm working with pumpkin, too, this week. (Who isn't? LOL!) I adore using orange juice in glazes, too. They're just so much sunnier. 😉 Thanks for sharing! P.S. Still not able to follow your blog in Bloglovin'. Not getting the feed and not sure what is up with that. But! You have been added to my blogroll. Hello!!!! I feel like its been forever since I've been to your blog. I just realized that Bloglovin isn't bringing your feed in! Not sure why, but I haven't seen any of your posts since April!!! No wonder I haven't been doing 12 Loaves….Sheesh! These scones look marvelous! So yummy!!! I am definitely putting them on my "to make" list! these look delicious, especially the pumpkin glaze! These are lovely, Lora! Fall on a plate. You know, cranberries are so under-appreciated. I'm so glad you included them in these scones… I think the tartness really takes it to a whole new level. Sorry I've been MIA recently. I've missed you! Wow, these are awesome. Pumpkin in the glaze, how interesting! Scones are one of my obsessions, and there are never enough recipes in my files. Adding this one! these scones are delicious!! I just made a batch! I love how easy they were to put together and that they only dirtied one bowl and one small pot from the butter! I used half whole wheat pastry flour and fresh cranberries because i had them around. 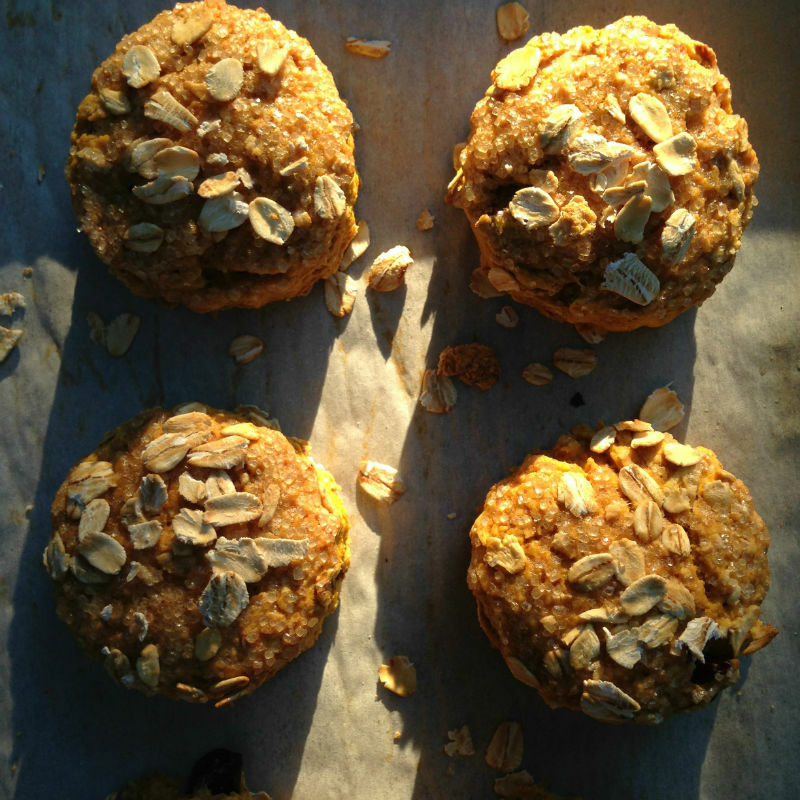 i skipped the glaze and am so happy to have found a healthy, simple, breakfast treat! I love scones and this recipe seems delightful! Yummy!